김덕원묘 출토 의복 일괄(金德遠墓 出土 衣服 一括)은 조선후기의 문신인 김덕원(1634∼1704)의 묘에서 출토된 유품들이다. 그는 효종 5년(1654) 진사, 현종 3년(1662) 문과에 급제하여 관직생활을 시작하였다. 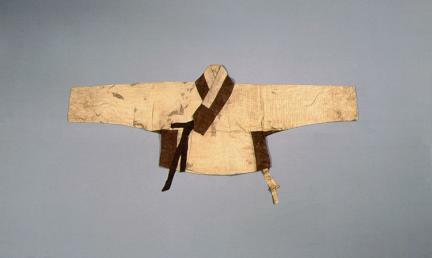 그 후 형조판서, 예조판서를 거쳐 좌의정을 지냈으며 숙종 17년(1691)에는 영중추부사를 지냈다. 출토된 유물에는 운문단 상복 2점, 운문단 철릭 1점, 소색중치막 1점, 누비직령포 1점, 아자문주저고리 1점, 명주겹광포 1점, 명주유상 1점 등이 있다. 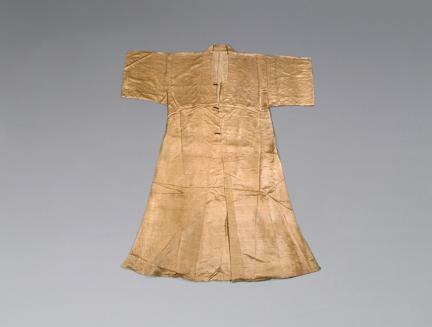 상복(商服)이란 평소에 입는 옷이다. 출토된 유물은 구름무늬모양과 칠보(七寶)무늬를 표현한 비단에 둥근 깃을 한 단령으로, 안에는 곧은 깃의 직령을 받쳐입게 되어 있다. 운문단 철릭은 구름모양과 칠보무늬의 어두운 갈색 천에 허리아래 양쪽이 트여있는 것이 특징이다. 철릭은 원래 단령 밑에 입는 받침옷으로, 다른 말로 첩리, 철릭이라고도 한다. 중치막은 곧은 깃에 소매는 넓고 겨드랑이 아래 덧 댄 무가 없으며 옆트임이 겨드랑이부터 있는 옷이다. 소색중치막은 지금의 두루마기와 같은 흰색 명주의 남자용 겉옷으로 뒷중심이 트여있으며 소매가 넓다. 직령포는 녹색으로 깃이 직선이며 안에 솜을 두고 2㎝간격으로 누볐다. 아자문주저고리는 아(亞)자 무늬의 명주저고리이며, 명주겹광포는 무색 명주에 솜을 얇게 두고 누빈 바지이다. 이 밖에도 소색명주창의, 명주누비창의, 반수의 등이 있다. 김덕원 장군의 묘에서 출토된 유물은 보존 상태가 좋고 매우 다양하여, 당시의 생활을 두루 살펴볼 수 있을 뿐만 아니라 복식사의 체계를 세우는데 중요한 자료가 된다. 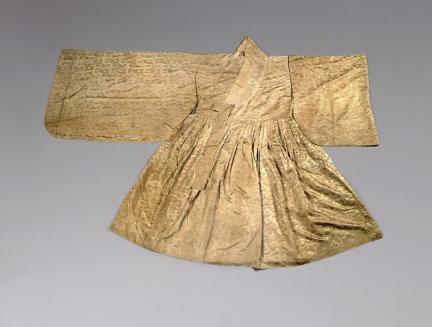 These clothes were found in the tomb of Kim Deokwon (1634-1704). 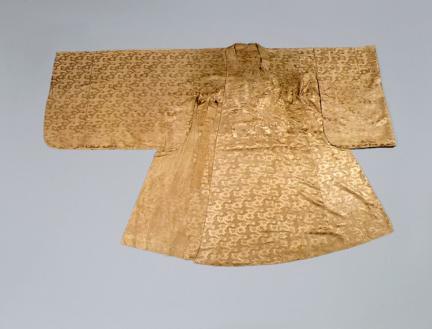 He passed his first state official examination in the 5th year of the reign of King Hyojong (1654) and the second in the 3rd year of Hyeonjong (1662) He served these kings and was promoted to the highest position in the court. 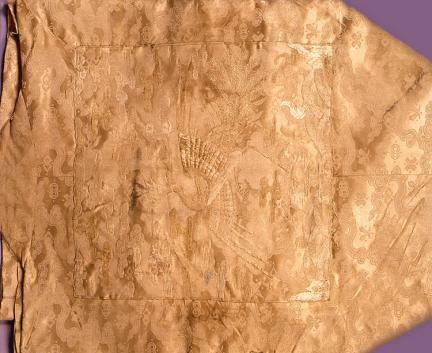 The list of clothes found in his tomb is as follows: *Unmundan Sangbok (2 sets): Sangbok is an ordinary dress. 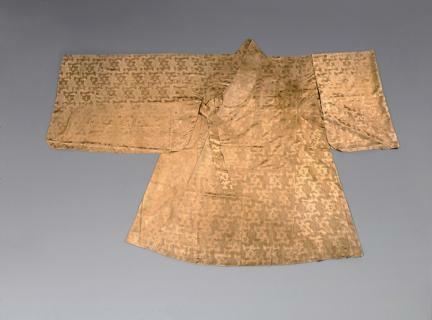 Those found in the tomb are an official uniform with a round collar made of silk with a seven treasures pattern and cloud patterns. 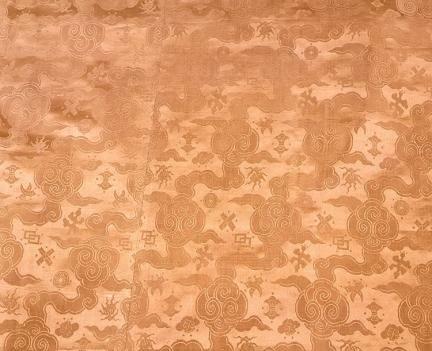 *Unmundan Cheollik (1 set): This has cloud and seven treasures patterns on brown fabric. 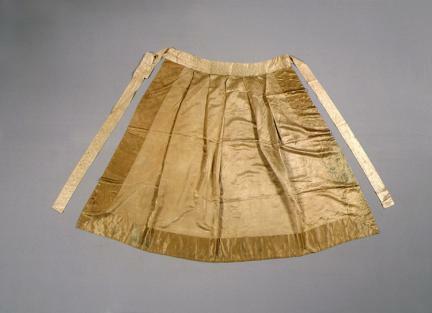 A special feature is that the sides of under-waistlines are split. 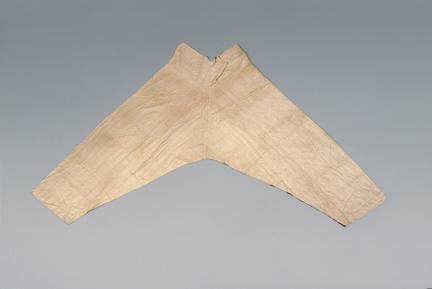 Cheollik (another word for cheomni) is the underwear for dallyeong. 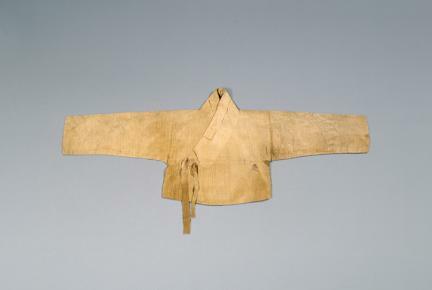 *Jungchimak (1 set): Jungchimak has a straight collar with wide sleeves and is split from the armpits. 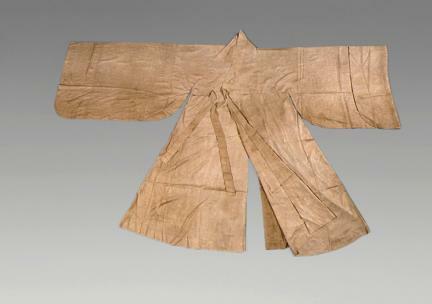 Sosaek jungchimak is a kind of Korean topcoat durumagi with split sides and wide sleeves. 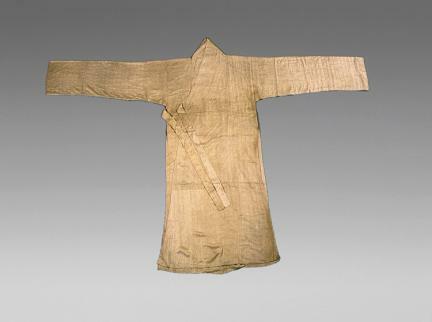 *Nubi Jingnyeongpo (1 set): The Jingnyeongpo is green in color and has a straight collar and cotton padding which is sewn at intervals of 2 cm. 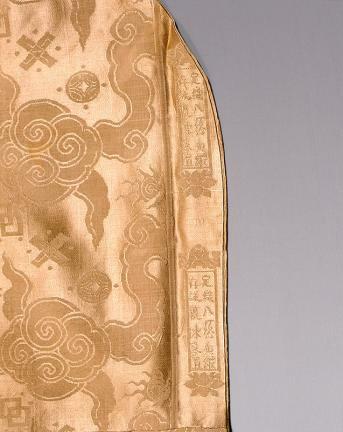 *Ajamunju Jeogori (1 set): The coat is a 亞-shaped silk fabric jeogori. 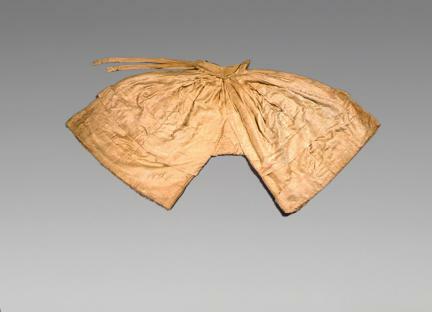 *Myeongjugyeopgwangpo (1set): This is a pair of silk fabric trousers with cotton padding. 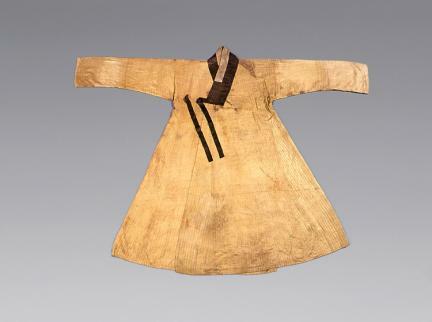 *Sosaek Myeongju Changui, Myeongju Nubi Changui, Bansuui etc. 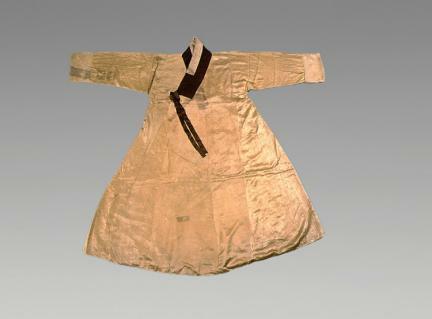 Various kinds of clothing in good condition were found in the Tomb of General Kim. 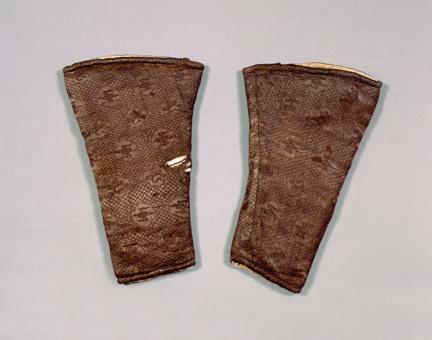 These relics are significant not only for the study of the lifestyle of the times but also for establishing a systematic formulation of the history of clothing and accessories.